Although I’ve been eating healthier for the better part of eight months, you might not have been able to tell that by the recipes I’ve been posting. I figured it was about time I get to it and share some more of the low-calorie love. We all need balance, and I’d say after my last brownie post, you’re due something a little on the lighter side. I wanted to participate in this week’s BSI (blogger secret ingredient) contest, this week’s ingredient being yogurt, so I dug my container out of the fridge and decided to whip something up with the bananas that were rotting on the counter. 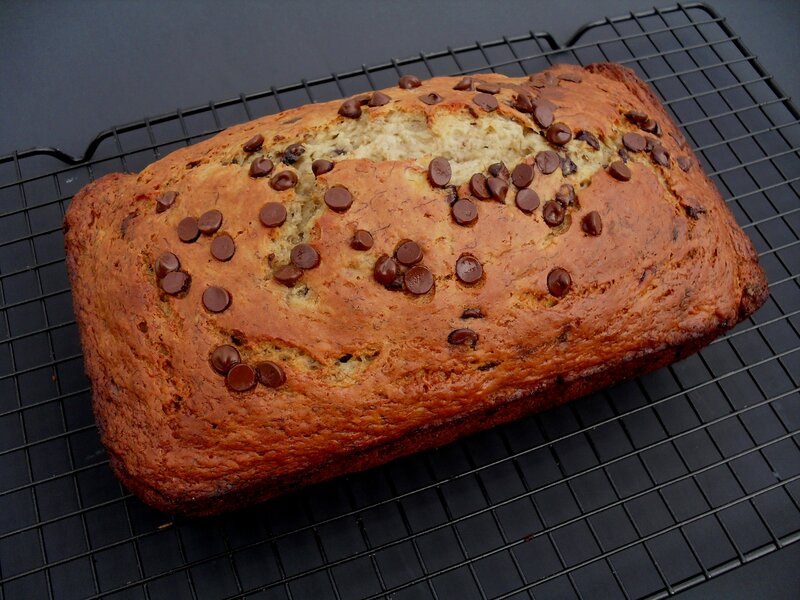 (Bananas that are nearly rotten give the best flavor for banana bread!) I’ve also been experimenting with baking with Truvia and have had good results when combining it with a little sugar in recipes, so I decided to do that here too. Thus this delightful bread was born! 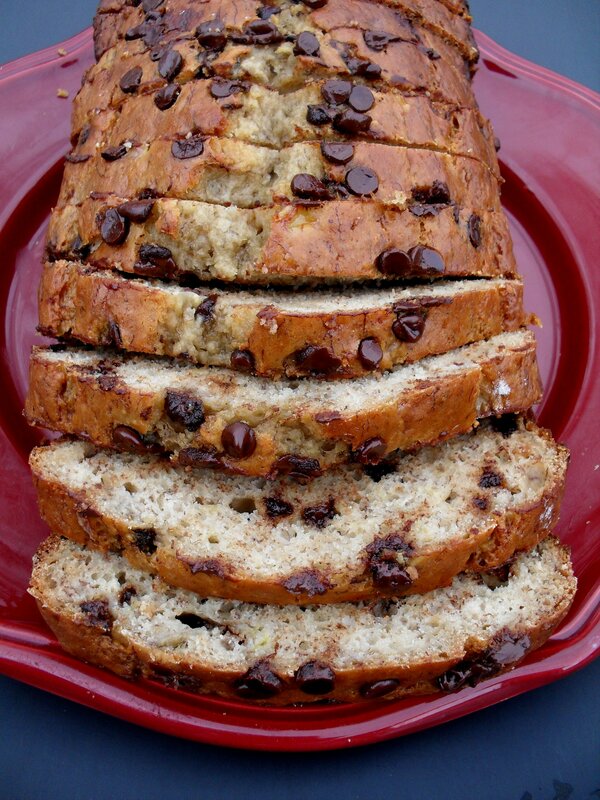 This is a moist loaf with a wonderfully sweet banana flavor. The chocolate chips are a nice little bonus. Though it doesn’t quite compare to my favorite banana bread, it is still really delicious and I didn’t feel the least bit guilty about having two slices for lunch, spread with a thin schmear of peanut butter (my favorite way to eat this bread)! This would be a good recipe to turn into muffins, and it would be easier to get even portion sizes that way too. Plus, you wouldn’t have to bake them as long, which translates to a center that’s even more moist! Preheat oven to 350 degrees. Spray a 9” loaf pan with cooking oil and set aside. In a large mixing bowl, combine dry ingredients and whisk to combine. In another bowl, mix wet ingredients. Add wet to dry, stirring until nearly mixed, then fold in the chocolate chips. Bake 50-55 minutes, or until a toothpick inserted in center comes out clean. Posted in Bread, Breakfast, Lighter Fare. Bookmark the permalink. Yum, and yum. Thanks for your BSI entry! I have a pumpkin bread recipe that Hannah and I just love – it has chocolate chips in it and my husband thought that was the strangest combo – what?! 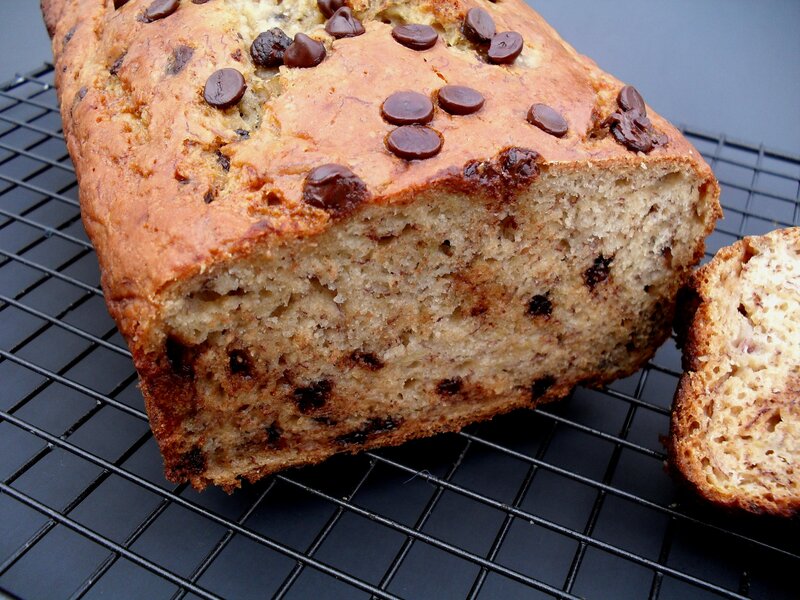 Everything is better with chocolate chips! Now if I could only find sugar free chips! (not sure they even make them!). Happy Friday Veronica – have a great weekend! I was wondering what the nutritional facts are for them being made into muffins. I followed the receipe and subsituted 3/4 cup of flour with whole wheat flour. It made 16 muffins in a 2.5inch cupcake liners. Thanks for your help! I just tried this recipe! Soooo good! Thanks! Yay! I’m so happy to hear that someone tried this. Thanks for letting me know–glad you enjoyed! HI! i just baked the bread, but without the choc chips! I used slightly more than 1 1/4cup banana, over-mixed the batter a bit, and added a little unsweetened cocoa powder. Is it mainly due to the lack of fat (aka i omitted the choc chips)? No, omitting the chips wouldn’t change the bread at all as they are self-contained and none of the fat leaks out into the bread. How do you measure your flour? For all my recipes, I pour the flour into the measuring cup and then level it off. If you scoop it and pack it in, you could be adding as much as 1/4-1/2 cup more flour than I used. I know over-mixing quick breads can make them tougher, and if you added cocoa then you might have needed to up the liquid ratio more than you did. Playing with baking recipes is tricky b/c the balance of liquid to dry has to be just so or it won’t turn out. If you want to add cocoa, take out an equal amount of flour. So if you add 1/4 cup cocoa, take out 1/4 cup flour. I hope the next loaf turns out better for you!